Chicago Blues tone in a grab-and-go package. It is perfect for small gigs and recording and with the 6L6 switched in, it can easily handle larger venues. It is Excellent with Guitars and Harps and takes pedals well. It goes from sparkling clean to brown and creamy distortion. Incredible sensitivity to attack, very nice distortion when you turn it up or use the Hi input jack. Check with Jason Fryer from River City Junction. It may be a little cleaner sounding than the later, 12AX7 based Champs but with the 6L6 option that the originals didn’t offer, it can seriously bark in the larger venues! For Harp players, Harpdog Brown played several Harps, live, through it and said it was incredible! Very beefy, noticeably better than some other amps he’s played. It is his go-to amp now! This little animal is what we nicknamed the T-Dog, and let me say it's the size of the fight in this dog, not the size of dog in this fight. Nothing but 5 watts of muscle and bark! 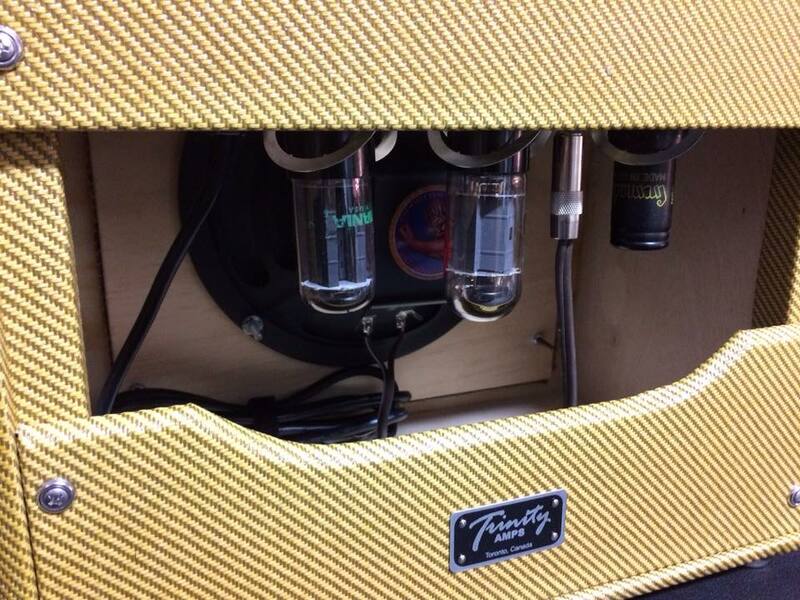 Overall, an excellent harp amp and a great blues guitar amp. Chicago Blues and classic rock (e.g. Neil Young or Stones) are well within the realm of possibility. Triton is a good name for this little amp! True to the era, all octal tubes were used in this Single Channel amp. 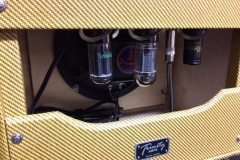 The circuit is extraordinarily simple, using one New Old Stock (NOS) 6SJ7 pentode in the preamplifier section to provide a single stage of voltage amplification, one 6V6 beam power pentode in the power amplifier section, a 5Y3 tube rectifier tube and a single volume knob with a by-passable tone control for those who want the raw energy. We added a bias switch so players can use a 6L6 and also a 4/8 ohm output switch used with our custom made Heyboer output transformer. 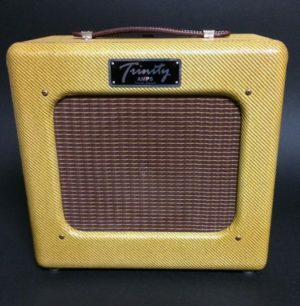 It comes housed in an Old-School 40s-50s TV front style lacquered Tweed covered cabinet and uses an 8″ Tone Tubby AlNiCo hemp cone speaker. Weight: 112 Combo 15 lbs.